Scientists have uncovered an unexpected new role for a protein that may underlie rare diseases. A protein, called p62, is chopped by molecular scissors to help cells realise that they are 'hungry', encouraging them to break down and consume old material in the cell. This helps them to stay healthy and fight off infection. The finding could help researchers design better drugs to help patients with Paget's bone disease, motor neurone disease or certain types of dementia. Mutations in the gene that makes p62 protein are often present in patients with these diseases. Scientists from Imperial College London published their research today in the journal Science Signaling. Their findings show that the chopping of p62 activates a new function, and that the trimmed protein has a new and unique function compared to the full-length version. The protein plays a critical role in the cell's recycling system, which breaks down old and damaged material. If this process doesn't work properly, old material can build up in the cell and give rise to disease. For example, this type of accumulation in brain cells is seen in patients with dementia. A related process helps fight infection wherein cells 'eat and recycle' microbes. This work may therefore also have applications for viral and bacterial infections. While the recycling function of p62 was well understood, it was unclear until now how these processes are regulated at the molecular level. This study is the first to show that trimmed p62 plays a role in sensing nutrients. 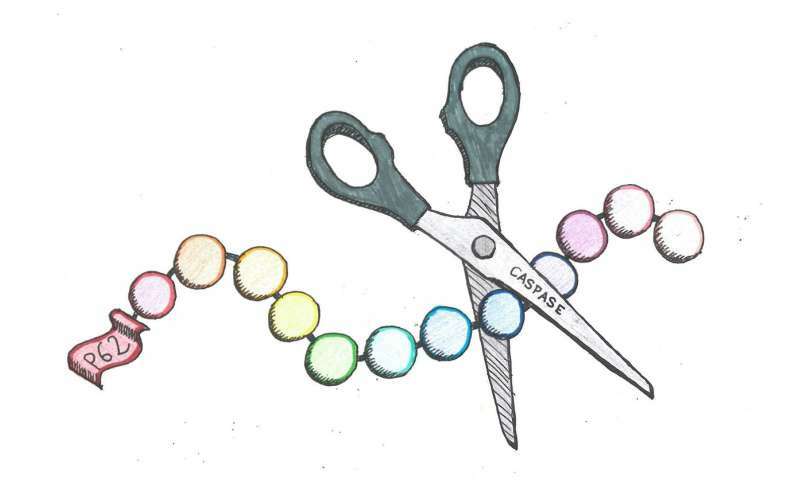 When 'molecular scissors' cut the protein, its sensor function is activated. This helps the cell decide when to stop eating old material to keep healthy and fight infection. Dr. Avinash Shenoy, from the Department of Medicine at Imperial College London and senior author of the study, funded by the Wellcome Trust, explains: "Molecular scissors are fascinating things, and we want to understand how and why they chop proteins in cells. "Cells only do things when they must and if things are done at the wrong time or at the wrong place, then you get disease. For cells to start recycling material, they must be able to sense that they're starving. The thing that we realized is that when cells are lacking in a certain nutrient, the protein p62 is chopped. And as a consequence, cells are now told that they need to do something about this." The team also found that when cells contained mutations linked to disease, the sensing function of p62 was compromised because the protein was not chopped. This affected the cell's ability to notice it should stop recycling and start producing new materials. However, using molecular biology tools the researchers were able to restore the function of the sensor. The long-term goal is to find ways to help people when the nutrient-sensing function is defective. This requires a better understanding of the fundamental processes that are connected to this mechanism. From there, researchers could design better drugs to target specific pathways that would create fewer side effects. The discovery follows a chance conversation between Dr. Shenoy and Dr. Vanessa Sancho-Shimizu, a research fellow also from the Department of Medicine. Dr. Shenoy's research focuses on the role of the molecular scissors known as caspases. He and his Ph.D. student Julia Sanchez-Garrido had been searching for evidence of the trimmed protein in immune cells that fight infections but were initially disappointed as those experiments were inconclusive. At the same time, Dr. Sancho-Shimizu was conducting experiments on skin cells from patients who suffered from severe viral infections and had mutations in some of the genes required for the trimming of the protein. This was the evidence Dr. Shenoy's group was looking for. Julia Sanchez-Garrido, the first author of the study, said: "I was close to giving up on p62 when Avinash and Vanessa had a chat. This was the start of a whole new exciting project. The existence of human disease-associated mutations that prevent p62 trimming took this investigation to a whole new level." Together, they found that p62 was trimmed in healthy cells but not in the cells of some patients who were more susceptible to viruses. This demonstrated the importance of protein trimming in diseased and healthy states. Their findings will help better understand infectious and non-infectious diseases. Their study also highlights how work on infections can help us better understand the recycling and housekeeping functions that go on in cells even in the absence of infection. Dr. Shenoy will be studying the molecular scissors and the trimming of p62 at the MRC Centre for Molecular Bacteriology & Infection at Imperial College London and at his Satellite Group at the Francis Crick Institute. "So many things could go wrong in cells because there are so many moving parts. It is fascinating, and we never stop being awed by the processes that happen in a cell," said Dr. Shenoy. "We showed so much can go wrong in a cell, and you can imagine how much more can go wrong in a whole body for example. A mistake gets amplified in effect to lead to disease."